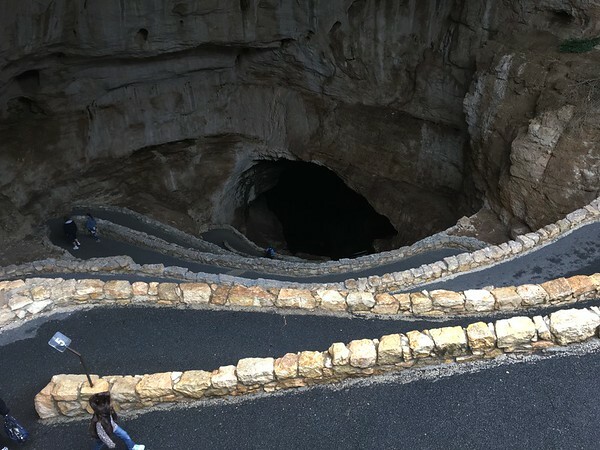 The elevator at Carlsbad Caverns is currently out of order. That didn’t bother us as we began our descent into the entrance. These are only the first five or six of about a hundred switchbacks on the way down. We made it down and back up again with no problem, but it was quite a hike! This entry was posted in 2017 Pic a Day on September 29, 2017 by Rebecca. 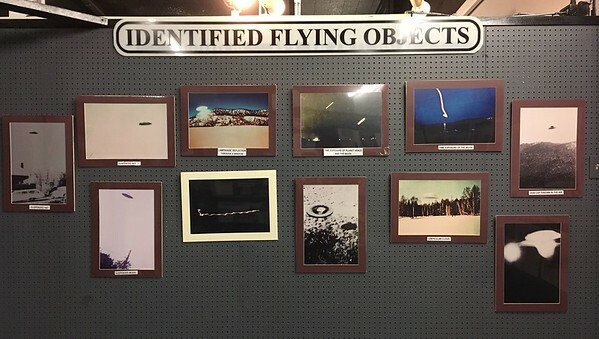 We spent a pleasant hour or so at the International UFO Museum and Research Center in Roswell, New Mexico. They were pretty passionate about presenting the story of the 1947 ‘crash’ of an alien spacecraft. We have had some happy surprises along the way, places we didn’t intend to go or didn’t know much about beforehand that turned out to be really neat. One of those places has been Bandelier National Monument in Los Alamos, NM. We had camped at the campground on the property the night before, so we were able to get down into the park quite early, before the shuttle busses were running. This gave us the opportunity to tour the cliff dwellings almost all alone. 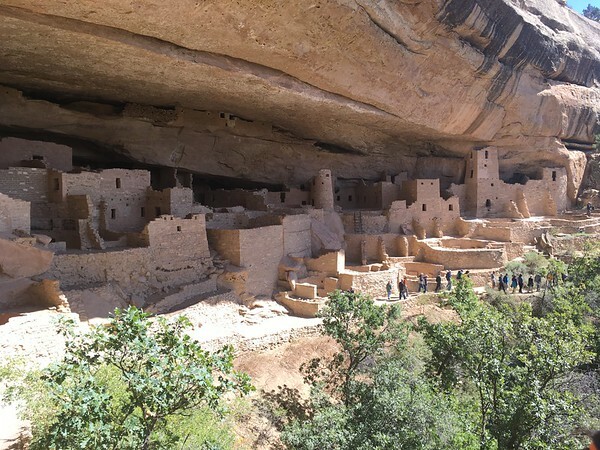 After Mesa Verde, these dwellings felt very small, but here we were allowed access to a few of the caves. We climbed up the ladders and into the dwellings and just sat, taking in how they felt and trying to get a sense of what it must have been like to live there. It was a huge difference from the more hands-off visit to Cliff Palace. Bandelier was a small NPS property, but well worth the visit. More often than not we have found ourselves without wifi or cell service as we roam around the country. Luckily, we brought a whole cache of paper maps with us and some old school map reading know-how. 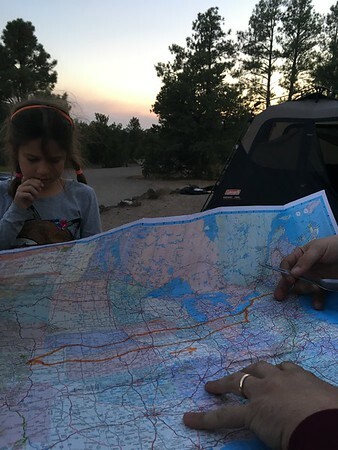 Our original trip route didn’t include Colorado, but we found ourselves charting a course for Mesa Verde National Park from Moab anyway. It would be an understatement to say that it was a great idea. We took the guided tour of Cliff Palace, which, at $5/person, was the best deal we’ve seen on this trip. We came down a narrow, rock staircase and hugged the cliff as our guide gave us information about the history of Mesa Verde and the cliff dwellings. 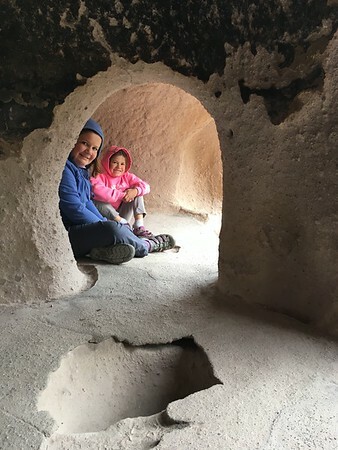 We then walked down around the kivas and dwellings and got to peek inside. The most exciting part, however, were the three narrow ladders that we needed to climb to get back to the top of the mesa. What an adventure! 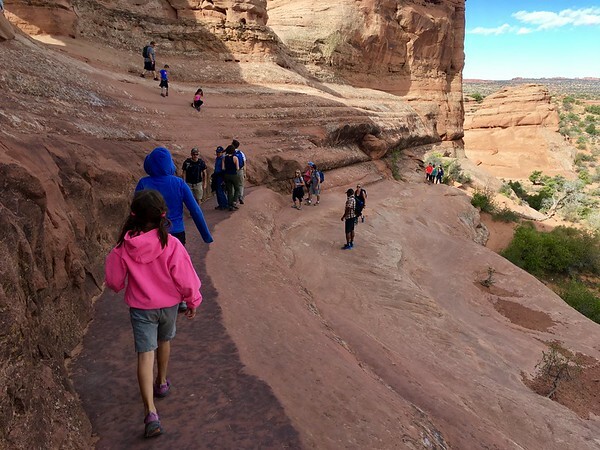 We got up early this morning and zipped across Moab to Arches National Park. We wanted to make an early start on the Delicate Arch trail and were happy to have beaten most of the crowds as we headed onto the trail at 8:30ish. The whole trail was interesting and different from anything we hike at home, and of course the arch was amazing, but this bit of narrow trail, hugging the edge of the rock, was my favorite bit. This entry was posted in 2017 Pic a Day on September 24, 2017 by Rebecca. 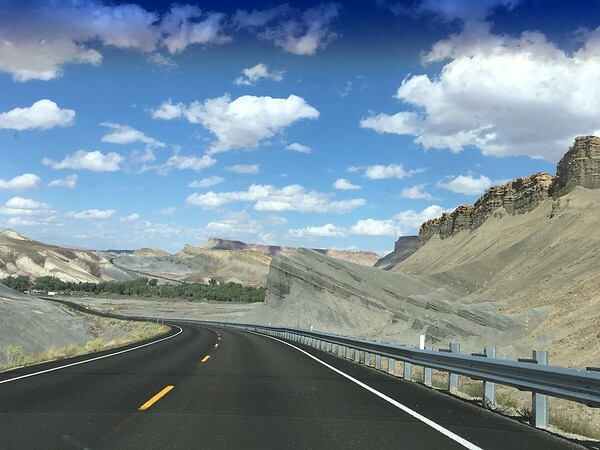 Coming out of Bryce Canyon today and heading toward Moab, UT, we took the advice of two separate retiree couples we’ve been along the way and drove Scenic Byway 12. Twists and turns, huge ups and downs, and more landscape changes than I could count made the trip fun, and the narrow road between two steep dropoffs as we crossed The Hogback made it spectacular. I was driving much of the way, but managed to get this pic toward the end of 12. Check out the pictures and the map at the link above for more info. Of all the music we’ve played in the car over the past month, it is the Okee Dokee Brothers songs that come to our tongues when the landscapes overcome us. 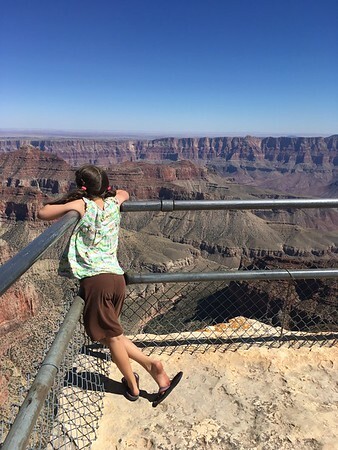 Our journey to the North Rim of the Grand Canyon definitely had us singing about Sam, especially the verse above. Clear here to hear it! 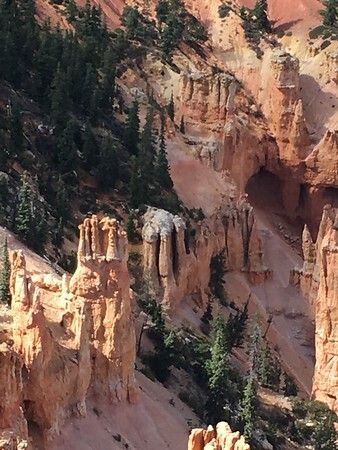 We spent Tuesday in Zion, where I learned about rocks and how sub par my photography is. The canyon was amazingly tall and beautiful and none of my photos could do it any justice. So I focused on people. 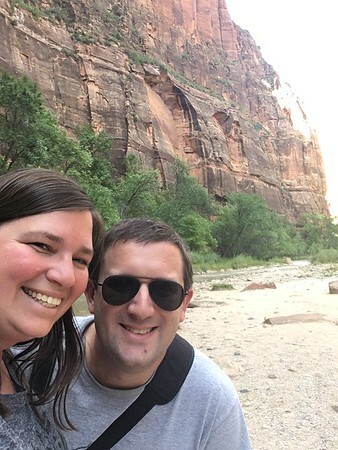 Here we are on the banks of the Virgin River. Not a mighty river, to be sure, but she carved out this canyon, so that’s something worth celebrating! This entry was posted in 2017 Pic a Day on September 23, 2017 by Rebecca.